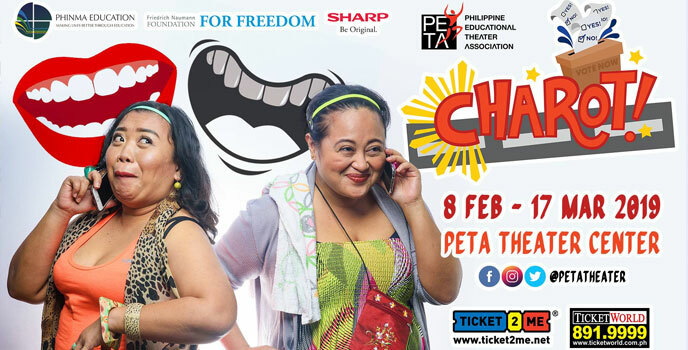 In line with the PETA’s (Philippine Educational Theater Association) 51st Theater Season ender, they going to take us to the year 2020 in the Philippines where the debate for Charter Change is still on-going. 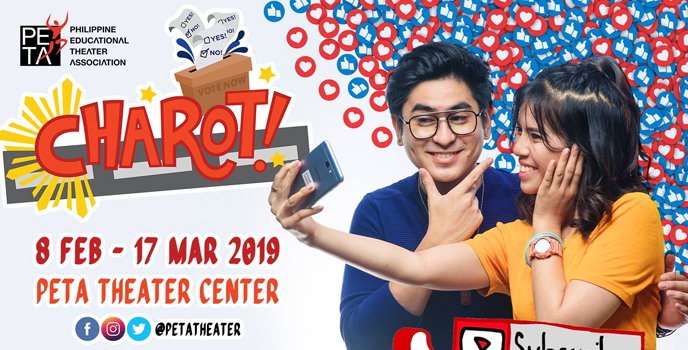 The comedy musical “Charot” will run from February 8 to March 17, 2019. The word charot is a Filipino colloquial term that means “just kidding,” underlines a pun. It is used to downplay an otherwise scathing statement to mere jest. A safe word, it turns its argument on its head, watering it down to avoid the ire of the message’s receiver. The comedy play with a song will engage the audiences by taking into account an important choice they will make during the play, that will decide how our story unravels. Because it is a PETA Theater production, we will expect a social-political approach that is an eye-opener for everyone. It will also throw out satire on a leader that showers kisses and calls first dibs on women, where God is painted stupid, and where “knock knock, who’s there” is answered by a gunshot to the head – everything is a joke. The dynamic cast of “Charot” include Jack Yabut as Papsy, Teetin Villanueva and Gardo Vicente as Millennial Girl, Bene Manaois and ABS-CBN Star Magic’s CJ Navato as Millennial Boy, Meann Espinosa as Tita Mary Grace, Sister Joy, and Karen De Villa, Kitsi Pagaspas as Nanay, Jason Barcial and Gie Onida as Boss, Gio Gahol and Lemuel Silvestre as Beki Grab Driver, Gold Villar-Lim and Jimma Nariz as Grethel Tuba, Icee Po and Rhapsody Garza as Mall Saleslady, and Norbs Portales as Street Vendor. 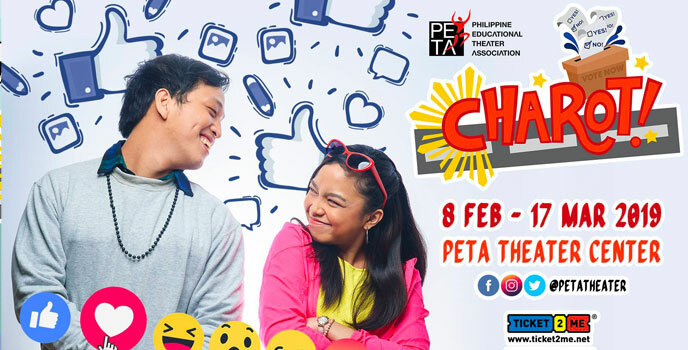 PETA’s “Charot!” runs from February 8 to March 17, 2019 at The PETA Theater Center, #5 Eymard Drive, Brgy. Kristong Hari, New Manila, Quezon City, with shows on Fridays (3:00pm), Saturdays and Sundays (3:00pm & 8:00pm). For inquiries and ticket reservations, contact PETA Marketing and Public Relations Office at Tel. No. 0927-603-5913, TicketWorld at 891-9999, www.ticketworld.com.ph, or Ticket2Me at 721-0431 to 33 loc. 8109, www.ticket2me.net.